Casa Eva is a lovely Village house that can sleep 4, It is located in Triana, which is a 45 minute drive from Malaga airport. There is a supermarket and 2 bars, to which you can walk to in a few minutes, that sell great value food. Triana is on a bus route taking you to the Town of Velez Malaga, where you can then get another bus to the beach resort of Torre-del-Mar. A car is not essential and airport pick-up can be arranged. Wi-fi is available. Kitchen: Fully fitted with Fridge/Freezer, Washing Machine, Dishwasher, Electric Oven and hob, Microwave, Toaster and kettle. There are plenty of utensils and pots and pans. Dining area: A great space to relax and enjoy your meal, with views out to the pool area. Bedroom: A great twin room, with plenty of storage space, beautifully decorated. Air-con. Bathroom: Next to the bedroom, Toilet, sink and Shower Cubicle. 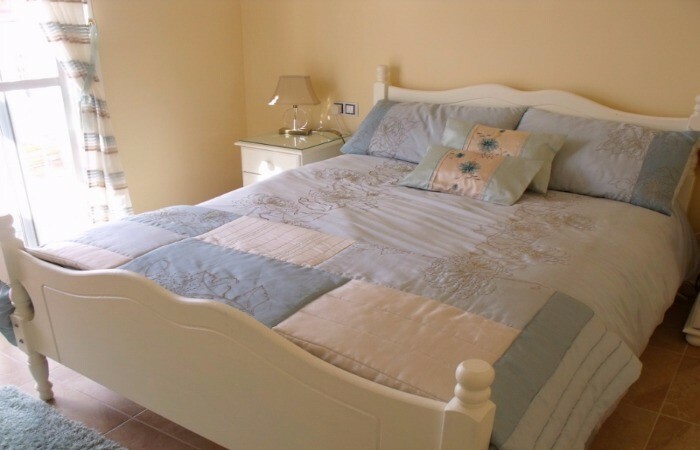 Double Bedroom: Very light and airy, with en-suite Bathroom: which has Large Shower/Toilet and Bidet and Twin sinks. Off this bedroom there is a large Terrace area that overlooks the front. Great for a relaxing breakfast in the morning. There is a great 8m x 4m Kidney shaped Swimming Pool, with lights, wonderful for a night-time swim. There are loungers and a Table and chairs for dining. There is also a Charcoal BBQ and Outdoor shower. The property has Air-con throughout. There is a new Communal Swimming pool and children’s playground, which is open in July and August. There is a Riding school in Velez Malaga, 10 minutes away where you can ride along the dry river bed, or for the more adventurous a trek up the mountains. The land around the village is used by the farmers to grow mango and avocado’s and you will see them in abundance at certain times of the year. The Nearest Beach is at Torre-del-Mar which is about a 15 minute drive away and the largest town of Velez Malaga is only 10 minutes away. Well I said on my review below from Aug 8th 2016, that we " would love to return again", and we did this summer from middle to the end of August. Everything was as we remembered. we are a family of 4 ,our children being 8 and 13, and for us this is the perfect villa. Spacious, secure, everything you need, all the home comforts, secluded private pool area. I regularly sat on the roof terrace in the mornings and watched the sun come up over the hills… Perfect. I recommend a car, as Triana is a quiet village 15/20 minutes away from anything else with an easy drive to get too and from Torre Del Mar, which is the nearest beach/town. David is a top Gent, very accommodating and nothing to much trouble. I would love to do it again and wouldn’t hesitate to recommend! Well equipped villa with everything you need. Pool area very private and sheltered so gets hot but there is a gazebo and umbrella for shade. We stayed end of July / beginning of August and pool got sun between about 9am and 5.30 - after that sun is on main bedroom terrace and roof top terrace. Village very quiet and a bit of Spanish is useful to get by. When we were there there was only 1 very typically Spanish bar which served food and was closed on a Sunday. The other bar which served a few tapas some days but no main meals was closed on a Monday. Only one very well stocked local shop which closes in afternoons and sundays and was only open in mornings in August. We didn’t have a car and were only 3 buses a day to local villages at random times. Where do I start....Booking on line can be a bit daunting and having heard some horror stories had some reservations - faith fully restored based on the great communications, help and support from David & Jacqui, which I would highly recommend their services, we met them both in person as they dropped by during our stay - what a friendly couple, and so helpful. On to Casa Eva, secure, self contained paradise, in a lovely village location. A little off the beaten track but comprehensive directions provided by David & Jacqui ensured our safe arrival at Casa Eva. Hire of a car I would recommend. Accommodation - perfect for a family of 4, and laid out wonderfully with open plan downstairs living with all the home comforts, and half a dozen steps outside the pool. Photos are a great indication of size and lay out and we were even happier when we stepped inside. If Casa Eva is typical of the properties provided then you will be very pleased with any of them, and David and Jacqui can't praise enough for their professionalism and would highly recommend! We have just returned from Casa Eva Triana , and had the most wonderful relaxing holiday , the house is lovely and catered for all our needs , the pool was a good size and we spent most morning's and all our evenings in the very private outdoor space , the village is only tiny with a couple of bars and a local shop that was extremely well stocked for its size ! We did hire a car so were able to explore many of the pretty villages and restaurants a couple reccommended by David ( that were excellent ! ) all in all a wonderful holiday . Fantastic Holiday, Family loved it and were sad to leave, We stayed end of July through August and the weather was lovely. The Villa is great and perfect for us, the pool area is very private and the Villa very secure with everything we needed. We had car hire so were able to venture out some days to the beach and evenings for dinner etc. A very enjoyable break and would love to return again. A beautiful house in a little Spanish village. So well stocked with kitchen equipment, bedding and towels in abundance. The pool is clean and perfect for the four of us to use. With a car it is in easy reach of a great shopping complex with a huge supermarket and the local village shop has a good selection.. Even marmite! We would return in a heartbeat . Thank you for a hot and wonderful holiday. A delightful 'casa' in a friendly village. Great location between the pueblos and coast. Teenagers stayed in studying getting necessary supplies from local shops; we went sightseeing and sampling local food and drink. Everything we needed in the house. A joy. Thank you David & Jacqui for arrangements and welcome (again). See you soon. This house is FANTASTIC a taste of rural Spain with all mod cons,fabulous kitchen,the pool area is amazing.I would recommend this property.David and Jacqui are great people and very helpful. Had the best 2 week stay at Casa Eva. 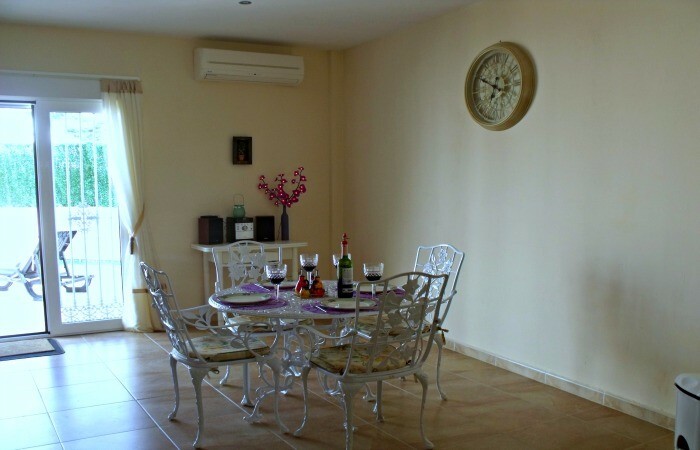 The house has everything that you could need and more, very spacious and spotlessly clean. We spent most of our time outside by the lovely pool, again very spacious area and not overlooked at all. If you don't like commercial, tourist resorts this is the place to go. The village of Triana is lovely, typically Spanish, locals are very friendly. The 2 bars both serve good food and very reasonable. We tended to go to the bar at the bottom of the road, staff knew us after few days and it was sad to say goodbye - until next year!